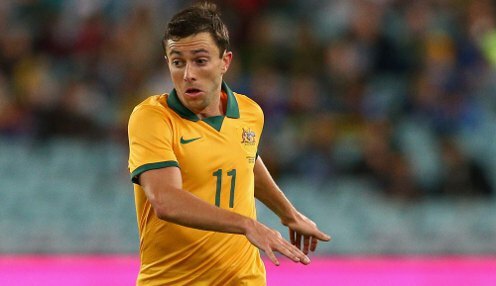 Tommy Oar's experience in European football stands him in good stead for his World Cup involvement with Australia, the 22-year-old believes. The Socceroos come up against two of the best teams in Europe in Group B, where they face 2010 winners Spain and the team they beat to lift the trophy, Holland. Oar had marked himself out in his first two years as a pro with Brisbane Roar as one to watch, but feels it's only since he moved to play his club football in the Netherlands that he's been able to take his game to the next level. He said: "When you're playing matches - which in the past couple of years I have been - you pick things up all the time, almost without realising it. You mature as a player." Since I went to Holland my game has come on a lot. Oar signed with Dutch agent Rob Jansen early in 2010 and, at the end of that A-League season, he was signed by FC Utrecht along with fellow Roar players Adam Sarota and Michael Zullo. The youngster made his Socceroos debut while still at Brisbane, and has gone on to play 15 times for the national side. He scored the only goal in Australia's 1-1 draw in Saitama against Japan last June that helped the team, then under Holger Osieck, qualify via second spot in their AFC group. Oar said: "Since I went to Holland my game has come on a lot, and that's down a lot to our trainer, Jan Wouters. He was a fantastic midfielder, and having him pass on all that experience and knowledge has made a big difference. "Holland's a pretty technical league so I think that part of my game has improved a lot. My decision-making for instance - when I first went over I was too keen to go forward all the time, and you learn the need to be a bit more patient." Australia are 1/1 to beat Chile in their World Cup opener, with Chile 1/1 and the draw 1/1. The Socceroos are 1/1 to win 1-0.